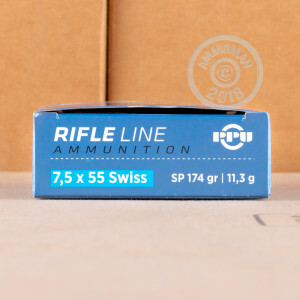 This 7.5x55mm Swiss ammunition from Prvi Partizan (PPU) of Uzice, Serbia is an excellent hunting round for medium sized game thanks to its 174 grain soft point bullet, which offers both strong penetration and expansion when combined with the cartridge's impressive ballistics. In contrast to most 7.5x55mm surplus ammo, which is Berdan primed, PPU's load uses non-corrosive Boxer primers. This makes the brass cases significantly easier to reload. Each box contains 20 rounds. 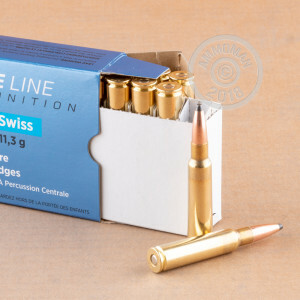 Comparable in performance to the .30-06 Springfield and the 7.62 NATO cartridges, the 7.5x55mm Swiss is one of the oldest military cartridges still in widespread use. Developed by Swiss military officer and weapons scientist Eduard Rubin, it was introduced in 1889 and represented a major shift in ammunition design for the time with its relatively low-caliber projectile and high muzzle velocity. Buy enough ammo to get your order total over $99 and you'll receive free shipping at checkout instead of the exorbitant S&H fee charged elsewhere. It's one of the reasons customers keep coming back to AmmoMan.com for their shooting needs! Thank you guys for still shipping to California for ammo transfers. Our laws are so terrible. It has been a pain trying to find K31 Swiss 7.5x55 for my dads old rifle. Theres none locally and online many of the sites are sold out or wouldnt do an ammo transfer or even ship to California. Thanks for standing by all Americans and helping Californians like myself be able to obtain ammo. Even when my state reps try to make it harder to legally obtain firearms, ammo and parts for good law biding citizens. Thanks again and God Bless.